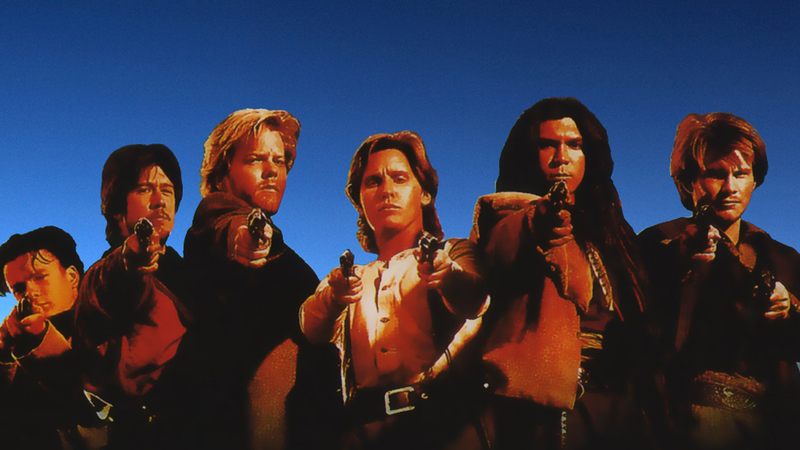 YOUNG GUNS 2 is an adequate 1990 followup on the rest of the story of Billy The Kid, started in the previous outing, two years earlier. This one rakes once more over familiar territory, bringing in Pat Garrett, Gov. Lew Wallace and assorted legendary pistoleros. It’s a sad day on the ‘North-40’ when James Coburn gets conventional co-star billing after a half-dozen pups, but that’s the way of the changing West(ern). If, like me, you liked the first, you’ll go for this: many did and it bushwhacked $44,000,000. Those young bloods are Emilio Estevez, Kiefer Sutherland, Lou Diamond Phillips, Christian Slater, William Peterson and Viggo Mortenson. Other pros wielding hot lead and cool one-liners among the cacti are Tracey Walter, Jack Kehoe, Bradley Whitford and Scott Wilson. Directed by Geoff Murphy.